Be the fastest skater on the hill. Powell Peralta Downhill Skateboard Wheels are the result of years of research and development by some of the world's top downhill and freeride skaters. The premium quality urethane and the H5 fiber infused core used in Powell Peralta Downhill Skateboard Wheels increases speed, grip, and durability, making them the go-to wheel for downhill and advanced freeride skaters around the world. 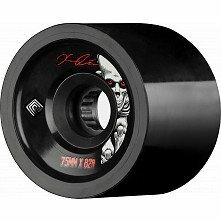 Browse our selection of Powell Peralta Downhill Skateboard Wheels and take your skating to the next level.